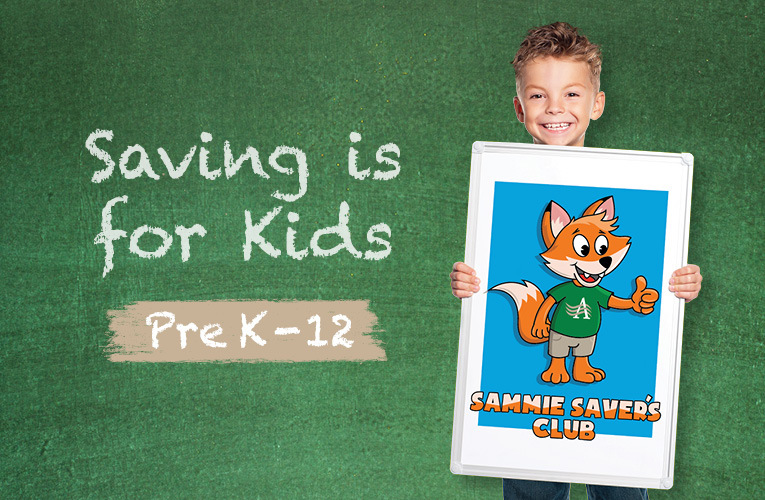 Sammie Saver’s Club is an awesome new way for kids of all ages to learn the basics of saving money. Sammie encourages saving by allowing kids to experience fun incentives, giving young kids toys and paying students for good grades. When a young member of the club makes a deposit, they will get to pick a toy from Sammie Saver’s Goody Box. When a student brings in their report card with all A’s or A’s and B’s they will get paid for those good grades. Sammie loves saving and wants to share the excitement. Child/Student must be present to receive deposit gift or payment. With each $10 deposit, the child can select a gift from Sammie Saver’s Goody Box with their FIRST deposit, he or she will receive a stuffed Sammie Saver to take home to remind them of their goal. They will receive a sticker for positive reinforcement. They will also receive a deposit book/register. Minimum $5 balance in account. Parents are encouraged to help. Child must be present to receive deposit gift. Our goal is to teach children that “saving” is fun. Sticker and stuffed Sammie Saver, if applicable. Access will pay $10 for straight A’s. Access will pay $5 for A’s and B’s or just B’s. (Nothing below a B will be paid). Each saver can be paid once (1x) each six week period. 6 x $10 = $60 max pay out per year. Must bring in report card before the next is issued. (One report card at a time/per period). Student must be present to receive deposit gift or payment. Checking account with debit card required. Access will pay $10 for straight A’s. Access will pay $5 for A’s and B’s or just B’s. (Nothing below a B will be paid). Each saver can be paid once (1x) each six week period. 6 x $10 = $60 max pay out per year. Must bring in a report card before the next is issued. (One report card at a time/per period). Student must be present to receive payment for grades.